No, this is not about shapeshifting robots, come to save or destroy Earth. It is about transforming the contexts within which robotic technologies are applied, and about practicing robotics with the intention of bringing about transformational results. In some cases this means finding better ways of accomplishing the same ends as before. In other cases it means pursuing ends that were previously unachievable. It hinges on the recognition that robotics is a revolutionary development, on the order of fire or writing, with the potential to transform everything it touches. 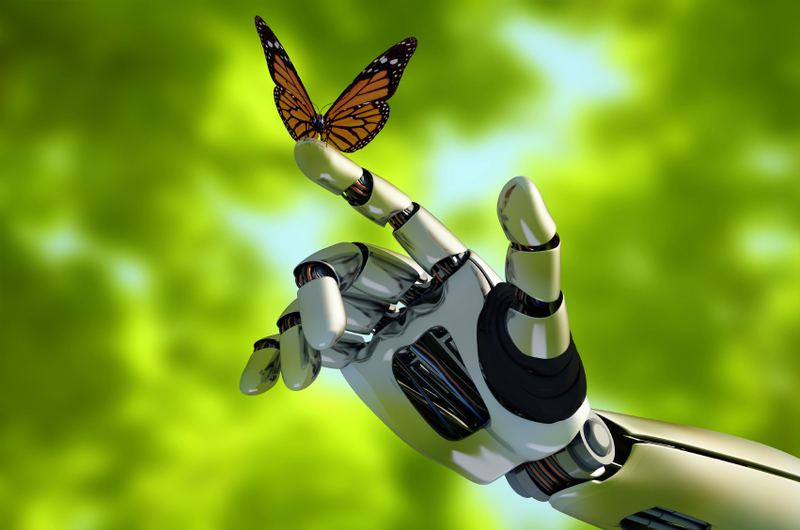 We can already see some early examples of how transformational robotics can be. In medicine, automated lab equipment long ago made the comprehensive metabolic panel screening test affordable, and surgical assistant robots have shown considerable promise. In aviation, modern airliners are capable of flying themselves from takeoff to touchdown, and remotely piloted or autonomous aircraft remove biological constraints on maneuvers. In space, were it not for robotics, most of what we know about the solar system, including our nearest planetary neighbors, Venus and Mars, would be limited to what we could learn through the use of telescopes, and there would be no serious talk of mining asteroids. Before jumping in to how this applies to agriculture, allow me to make one additional point about transformational robotics in general, which is that you can ordinarily expect a transformational application to make more intensive use of technology than an application that simply automates some familiar process or procedure – being mechatronically more complex, or expending more cpu cycles per unit of physical energy used, or both. This is because, in transformational applications, the machines will typically be taking more into account and choosing from a larger, more flexible repertoire of deft actions (precise in context, although not necessarily especially precise in the sense of repeatability). The key to both understanding and making a case for transformational robotics (in pursuit of private investment or government funding) is to focus on the goals to be served, rather than on current approaches to achieving them. 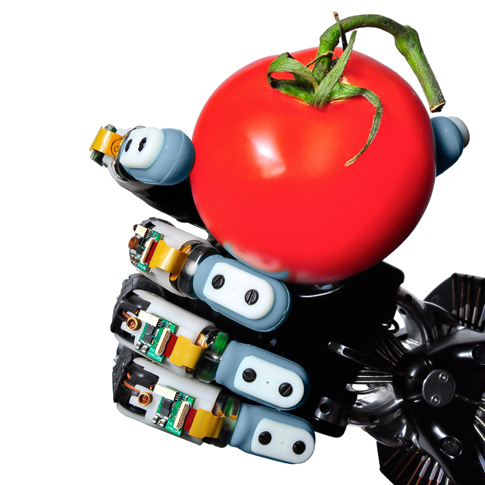 (‘People have to eat, but we also need to preserve and improve fertile land and provide space and habitat for native species.’ versus ‘How can farming as we know it be made more efficient?’) Those current approaches may be ruts, out of which the transformational application of robotic technologies can lift us. In this regard, it is important to include goals we wish to serve which are currently being ignored or given short shrift, whether because no business case can be made for them at present, or because the cost would be prohibitive. Much of the added value of transformational robotics stems from serving ends to which we have previously given little more than lip-service, often for essentially zero additional cost. Now let’s consider the application of robotics to agriculture, beginning with the current state of the art. The most common use of automation in agribusiness has traditionally been in processing plants, after the food has left the farm, although more and more such operations are being installed on the farm. For plant products and eggs this begins with cleaning and sorting, and any sort of product may be automatically packaged or bottled and packed for shipment. DeLaval Milking Station. Photo credit: High Contrast, via Wikimedia Commons. 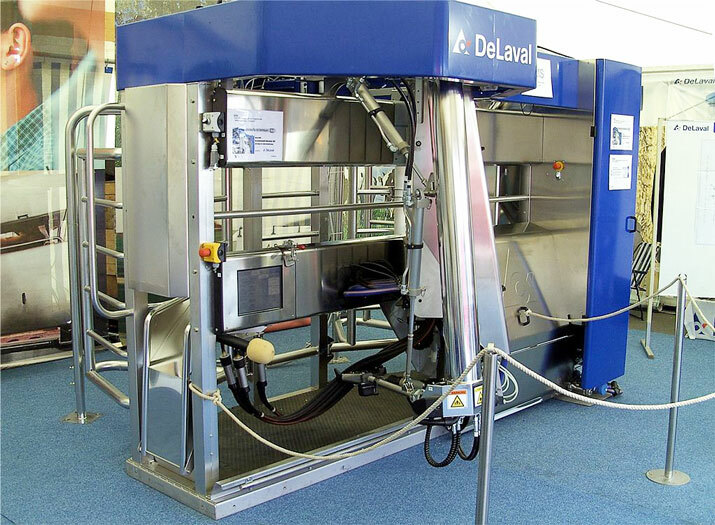 On dairy farms, robotic milking machines are becoming increasingly common, essentially allowing the cows to milk themselves. In the fields, new tractors now commonly come with GPS-based automated steering, allowing them to make more efficient use of the fuel they burn by reducing overlap from one pass to the next and to preserve soil conservation measures, such as terraces, by following contours more accurately. Combine harvesters may have both automated steering and automated ground speed, to keep them working near their peak capacity without pushing material through so quickly that they become clogged. Spraying equipment, whether tractor-mounted or self-propelled, can now meter out fertilizer, pesticides, herbicides, and fungicides, applying more on parts of the field where the need is greater. A recent development is planters that place seeds more deliberately than in the past, achieving a more even stand using less seed. Grapevine pruner. Photo credit: Vision Robotics Corporation. Orange harvester. Photo credit: Vision Robotics Corporation. 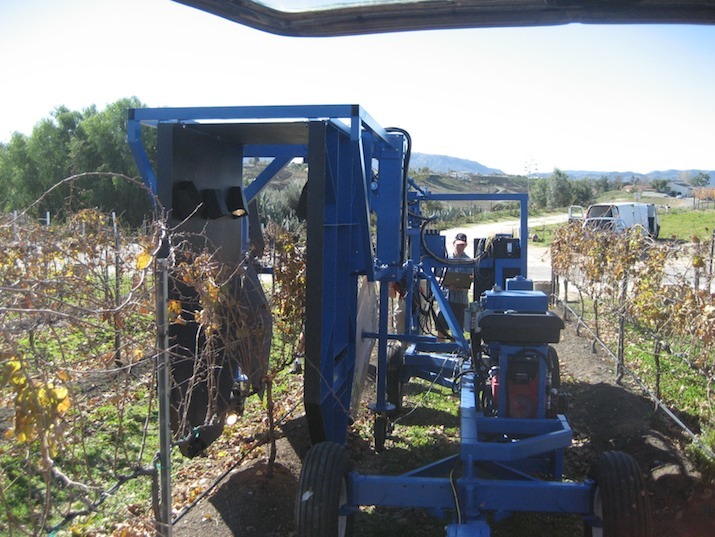 While perhaps not yet commercially available, automated pruners for vineyards and automated fruit harvesters are in an advanced stage of development, and should soon be commonplace. And last, but far from least, UAVs, commonly known as drones, can make an abundance of valuable information available to farmers, and the business of providing such services is set to take off like a rocket just as soon as the FAA determines that the time is right. MIT-CSAIL-DRL-Distributed Robotics Garden. Photo used with permission from Nikolaus Correll. 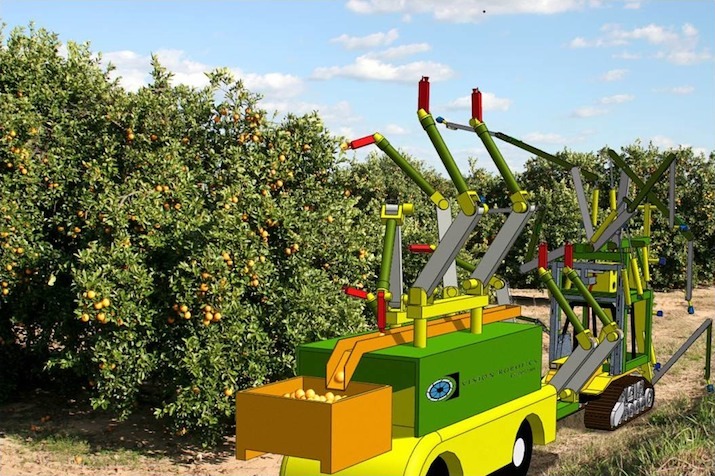 When apples are in clusters or obscured by leaves and branches, a robot requires complex algorithms and long computational time to identify them. If this is true of fruit hanging from trees in orchards, more or less in plain sight, it must be even more true of ground-hugging herbaceous plants, the main stems of which may be hidden in deep shade, and still more true when those herbaceous plants occur in polyculture mixtures. Shadow Hand equipped with BioTac System. Photo credit: Shadow Robot Company. Another such challenge is enabling machines to nimbly reach through foliage without damaging it. For any device that isn’t itself ground-hugging, this is essential for weeding and for planting a second or third crop under an existing canopy of leaves. While much of this work might be accomplished by small devices, moving across the soil surface, there are tasks for which (pruning) and circumstances in which (soggy soil) devices suspended from above the leaf canopy would be more effective. The word ‘nimbly’ suggests both speed and a light, deft touch (sensory-driven precision), and both are intended here. Machines of a scale to support one or more suspended robotic arms, even very light arms, while less massive than most conventional equipment, would still represent a significant investment, and would need to operate quickly to be cost-effective. Quick motion means even quicker electronics to plot paths, gauge the forces needed to produce them, updating these with corrections as deviations are detected, and compensating for environmental factors such as wind-load, slope, the weight of a fruit being picked, and so forth. Quick motion also means being quite certain about the nature of the objects in one’s immediate vicinity, since they might include livestock, cherished pets, or human beings. 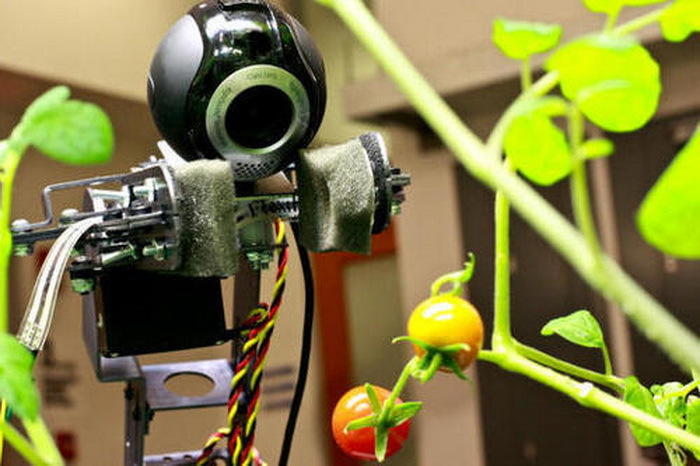 Given solutions to these primary challenges – and autonomous operation – in addition to planting, weeding, and harvesting, robotic machines might track the development of individual plants; detect nutrient deficiencies, toxic conditions, disease, and infestation; selectively prune affected leaves or branches, or selectively remove whole plants; collect plant material for shredding, anaerobic digestion, and/or composting; lay out soil sensors or tubing for drip irrigation; attach vines to elevated supports; employ mechanical methods of pest control and deploy biological pest controls. Beyond this they might also engage in crop development, by collecting pollen from certain plants and applying it to others, and through the collection of seed from plants with preferred characteristics, selecting from those based upon nondestructive testing of individual seeds. They could even monitor and to some extent manage populations of wild animals, such as mice, rabbits, and deer. In principle, there is no farming task which machines could not be made capable of performing. Patch together enough such capabilities, at reasonable cost, and sooner or later you arrive at a tipping point, beyond which it makes far more sense to think about what you would like to see done, and how robots might be made capable of accomplishing it, than to take the more familiar approach of automating conventional methods. On the other side of this tipping point, agriculture may look very different from how it appears today. If the machines operate autonomously, then one farmer can conceivably have many of them all working at the same time, even working around the clock through the peak workload of the season. If there are many of them, working long hours, they can be smaller, lighter, and slower than conventional equipment, and, partly due to economies of scale in their manufacture, far less costly. If they are smaller, slower, and more numerous, they can take a more detailed approach to manipulating their environments. Given sufficiently detailed manipulations, it becomes possible to adapt the best practices of gardening, applied on a grand scale. Also, given this data/detail-intensive approach, production can be closely linked to changing market conditions, helping to keep the operation profitable. Besides the needed research mentioned above, the ground floor opportunities in this scenario run the gamut of robotic technologies, from making equipment safely mobile through densely planted fields to sensory hardware, to processors, coprocessors, and algorithms for sorting out the sensory data, to end effector design and capability modeling, to force-control motion planning, actuation, result monitoring, and heuristics, and on and on. The singular reality that makes such a grand effort more than a fool’s errand is the scale of agriculture, and its potential to jumpstart a larger, more robust robotics industry, underwriting investments for developments that will enable further transformational robotic applications in other contexts.